Today I will show you how to make another chocolate vegan dessert. 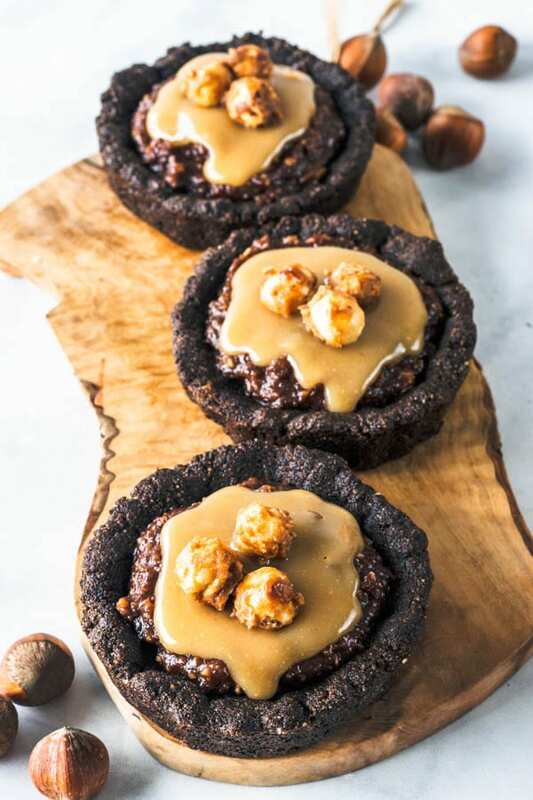 I present to you my Hazelnut Vegan Chocolate Tarts with delicious Vegan Caramel Sauce. The best you’ll ever try! 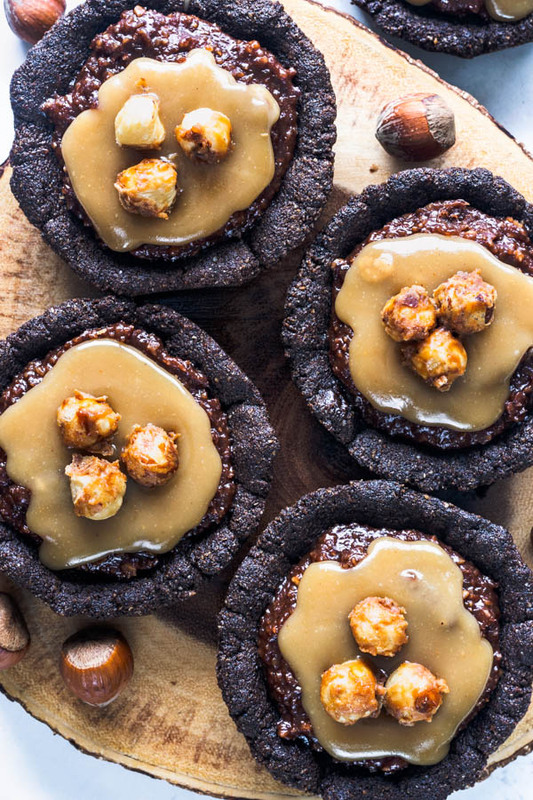 This recipe is also gluten-free, refined sugar free, and paleo. 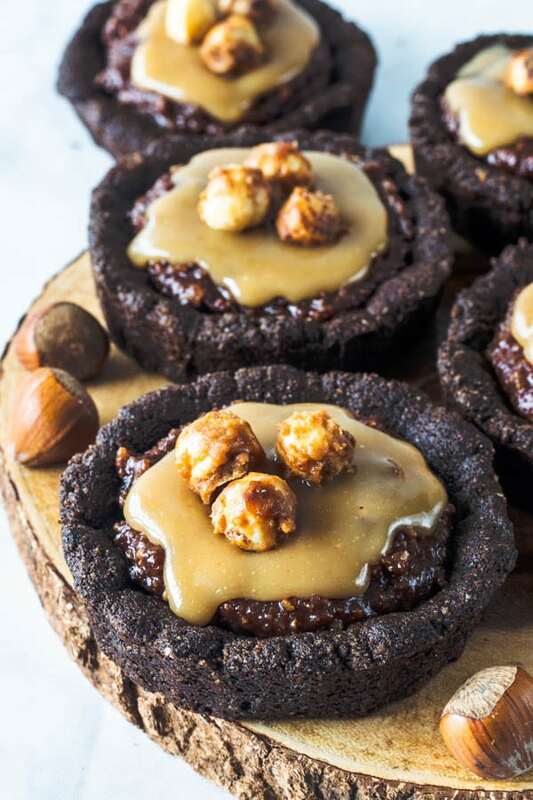 These vegan chocolate tarts are my favorite ones to date. I have been making quite a lot of vegan dessert recipes for my blog. 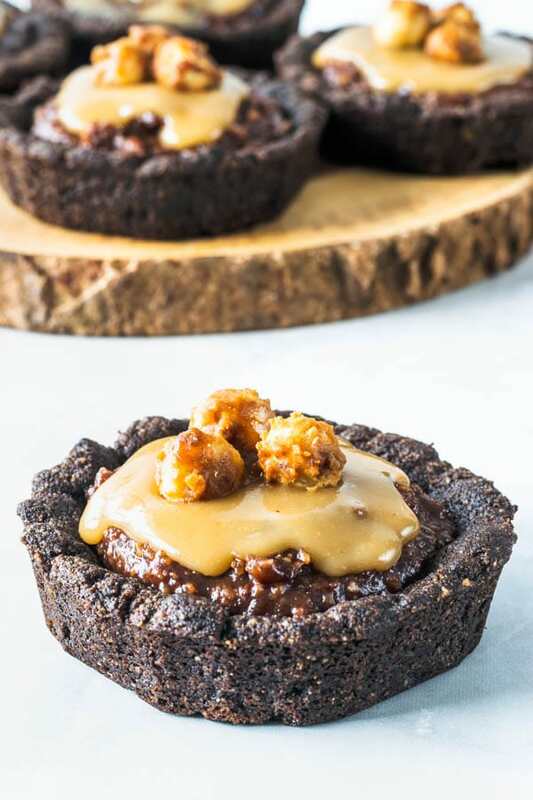 I already have a favorite vegan mini tart I adore, which is the recipe for my Peanut Butter Vegan Tarts. 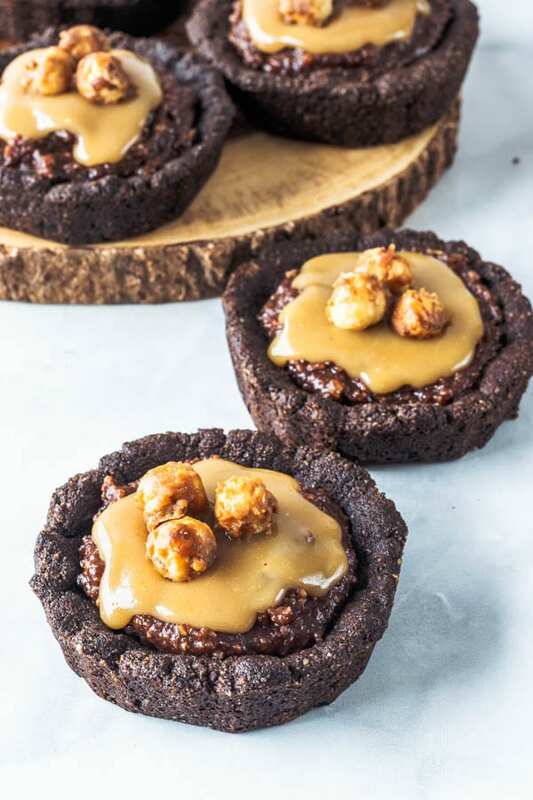 Other vegan tarts and pies you might like: Chocolate Chip Cookie Vegan Pie, Orange Cranberry Vegan Pie, Pecan Brownie Vegan Pie. And as I was saying in the beginning, this is indeed the best Vegan Caramel Sauce you will ever try in your life. It’s super easy to make (only 4 ingredients) and you will never want another caramel sauce in your life, vegan or not. I promise you won’t regret making this vegan caramel sauce. 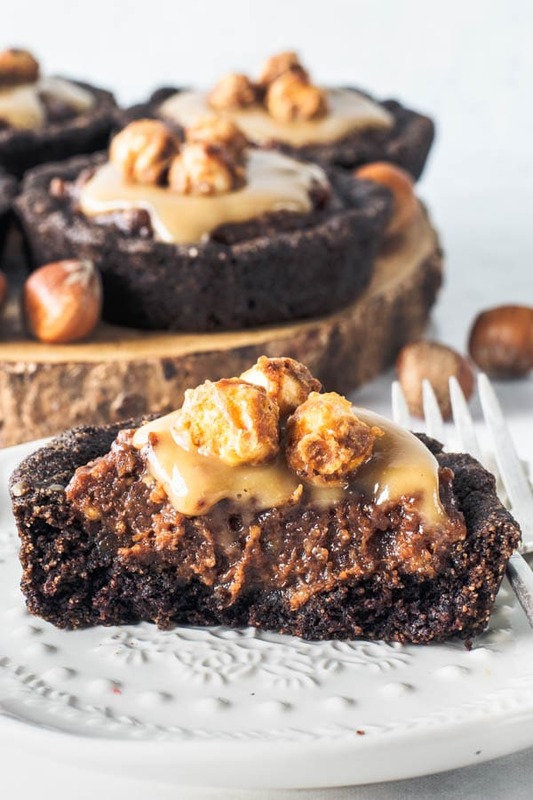 Take a look at other recipes where I use this fabulous sauce and tell me how mouthwatering this vegan caramel sauce truly is: Vegan Brownies with Caramel Sauce, Fig and Pistachio Vegan Cheesecake. 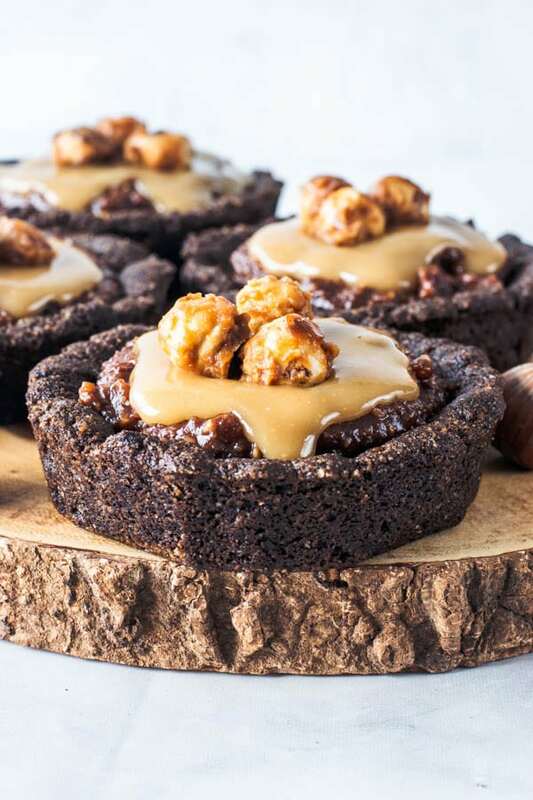 The vegan caramel isn’t the only thing that stands out in this recipe. The fudgy middle is the best thing ever. Check it out for yourself. So creamy and super easy to make! Check out the recipe below! I understand it’s probably a lot of steps. 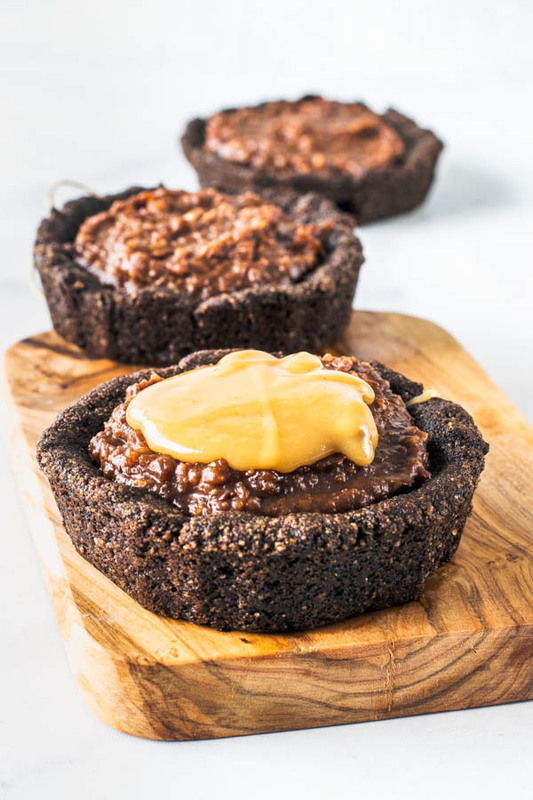 First, you gotta make the crust, then the filling, the caramel, and the caramelized nuts. But I promise you all of these steps are very uncomplicated and make for a very fun baking day. I used mini tart pans (3.5″) for this, but you are free to use whatever tart pan or pie plate you would like to make your vegan tarts. You may use a large 8″ or 9″ tart pan, or smaller ones like I did. 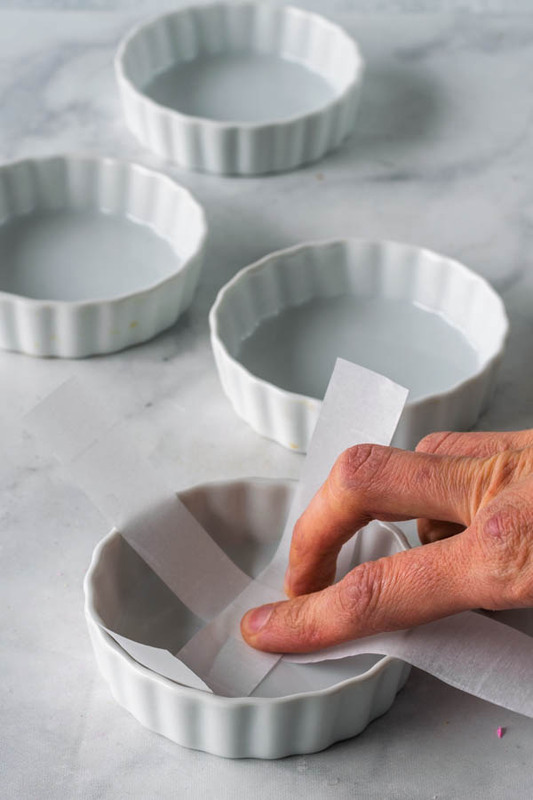 First, you want to cut strips of parchment paper and place them crossed in your tart pans. TIP: Brush your pans with melted coconut oil so the crust will be easily removed once baked. Now, press the crust dough onto the bottom of the pan. TIP: Use a bit of almond flour to help press the crust dough onto the bottom of the pan, since the dough might be a bit sticky. Remember to poke the bottom of the crust before baking it. Also try to place the crust in the fridge, or freezer while the oven pre-heats, and that’s because you will make sure the fats in the crust are at solid state when they enter the oven, and your tart crust will have a better structure if the fats don’t immediately start melting in the beginning of the baking process. 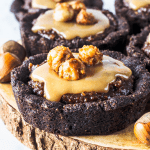 Once cooled, you may fill the crusts with the fudgy hazelnut filling. Now top with the delicious caramel. The Vegan Caramel Sauce will pour best a few minutes after made. You should make the caramel sauce, wait about 5 minutes, and then pour over your tart. And also, don’t forget to caramelize those nuts. 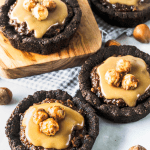 This recipe for vegan and paleo caramelized nuts can be used at any time for a delicious snack. You can use different kinds of nuts if you want. 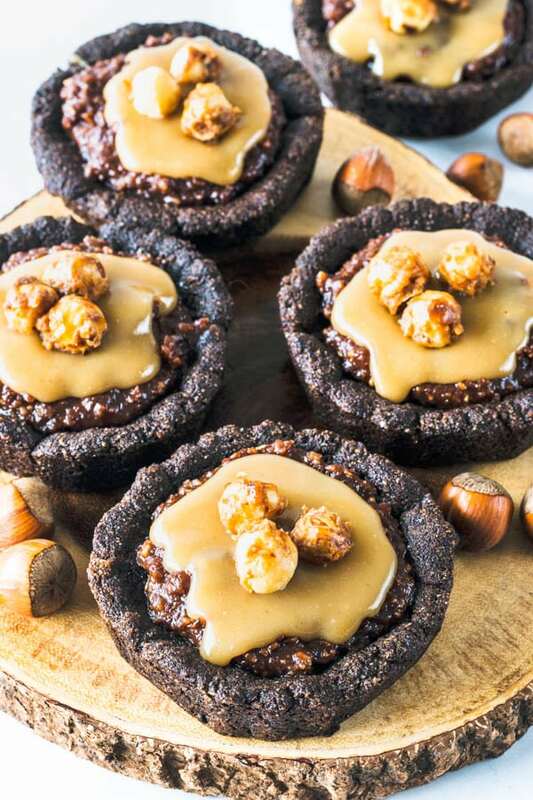 Whatever you do, just stop snacking on the nuts before you run out of nuts to top your tarts. Any leftover nuts can be kept in an air-tight container for 1-2 weeks, at room temperature. 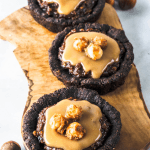 Let’s remember that these tarts are not only vegan, but also paleo, gluten-free, refined sugar free. 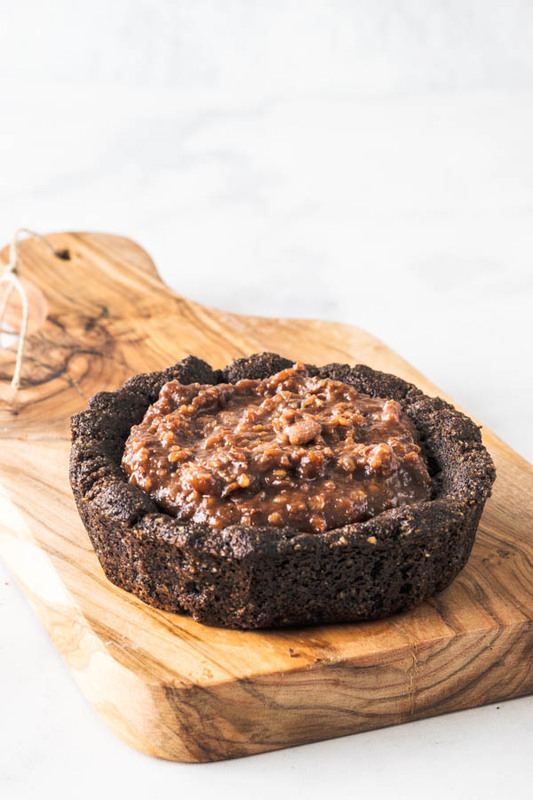 I like making desserts like this chocolate vegan tart, because of the ingredients usually involved in vegan and paleo baking. And I mean things like: coconut butter, any nut butters, almond flour, coconut oil, lots of nuts, dates, maple syrup. 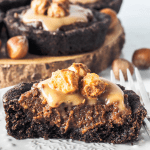 Those are some of my favorite ingredients ever, that combined just right will give you decadent desserts free from processed stuff. A lot of people ask me if I am a vegan, considering the amount of vegan recipes I’ve been posting lately. In reality, I have been a vegetarian for most of my life. I am not really sure if I would make a full transition into veganism. Maybe, who knows. I am definitely inclined that way, but for now I still eat stuff like eggs, cheese, real butter. And my savory diet is pretty on point, lots and lots of vegetables, tofu, avocado, fruits. I am just a girl in love with vegan baking, that’s all. And I definitely believe in a diet without eating meat, I really intend to stay this way for the rest of my life. And I am going where my heart takes me. For now it’s taking me down this path of vegan desserts, macarons, cupcakes, and more pies. Some vegan, some not. I hope I can add some value to all kinds of bakers out there! I hope you enjoyed today’s recipe. 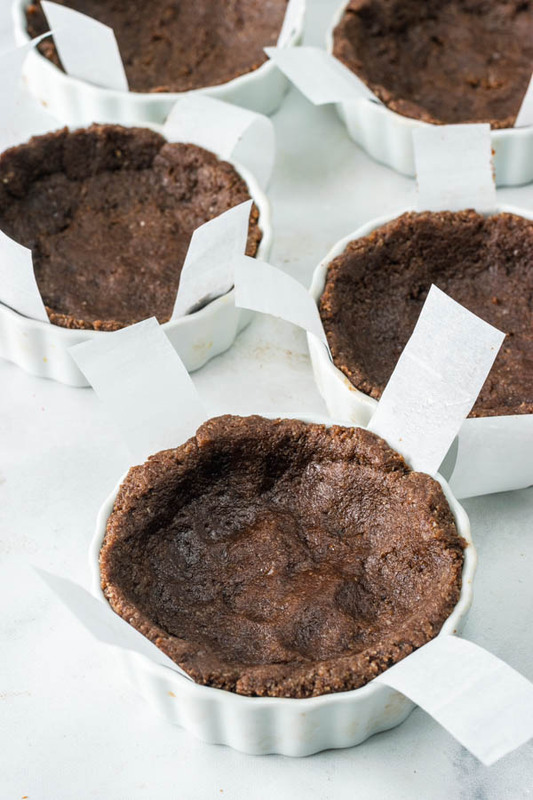 I had a fun time photographing these vegan chocolate tarts. I made a video of my photography set up while I was shooting these tarts, and out it on my stories on instagram, it’s on my highlights if you want to check it out on my account @piesandtacos. 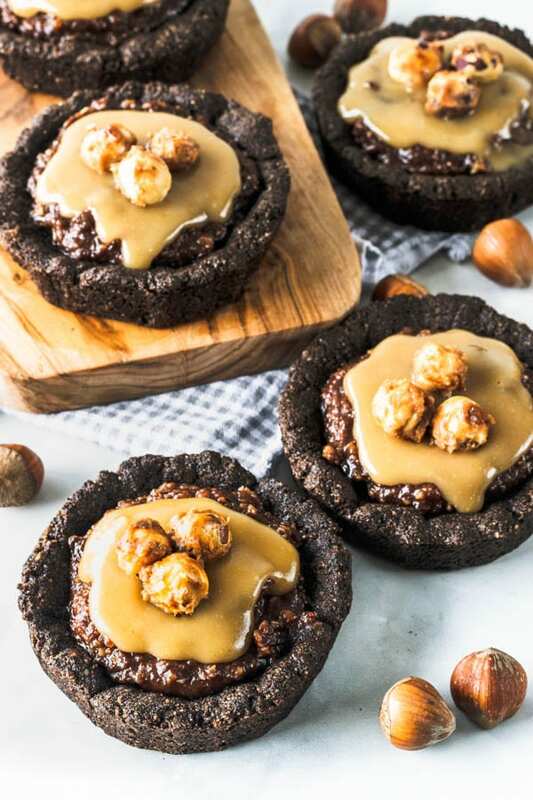 These vegan tarts will steal your heart. They are fudgy, chocolatey, and nutty. Also paleo, gluten-free, refined sugar free. Mix almond flour, cocoa powder, baking soda and salt. Whisk to break up any large lumps of almond flour. Press it to the bottom and up the sides of a tart pan or a pie plate, I used mini 5” tart pans, you can use a larger 8” tart or pie plate. Brush your pans with some melted coconut oil to make it easier to remove the crust after baked. Poke the bottom of the crust a bit to release air trapped in the crust, as it bakes. For smaller tarts such as mine, you can bake for about 15 minutes total. Rotating in between. Start by baking the crust for 5-7 minutes until the edges are just set. Remove from the oven and shield the sides of the crust with some foil or pie shields to protect it from getting burned, because they will start to brown quickly. It also helps if you bake your pie on a lower rack in your oven. 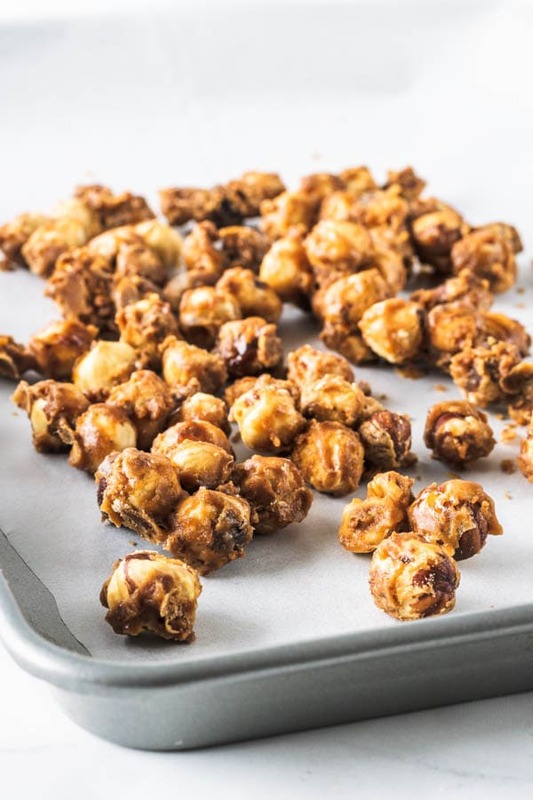 Start by soaking hazelnuts overnight, or in hot water for at least 6 hours. Drain, squeeze them gently to remove excess water. Place hazelnuts, dates, nut butter, coconut cream, vanilla extract, salt, and melted chocolate in the bowl of a food processor. Process for a few minutes, scraping in between, until a smooth mixture is formed. Hold yourself from eating the whole thing with a spoon. Mix all ingredients in a small saucepan. Bring to a boil while whisking constantly. Keep whisking mixture until smooth. Take it off the heat and let it cool down for just a few seconds. Then pour mixture. It will start to set pretty quickly, so you have to pour right after you turn the heat off. Otherwise, it will have more of a spreadable consistency. Mix nuts, coconut oil, and maple syrup in a small saucepan. Place it over medium heat, and stir constantly until it starts to come to a boil. Let mixture cook down while you constantly stir. Nuts will start to toast and caramelize. Add one or two more tablespoons of maple syrup if your mixture is too dry, and not caramelized enough. Once your tart crust is cool, you may add the filling to it. Spread it around and smooth it with a spatula. Place it in the refrigerator for a few hours to firm up. Make caramel right before you are going to pour it over your chilled tarts. Once tarts are chilled, pour a little bit of caramel over them. 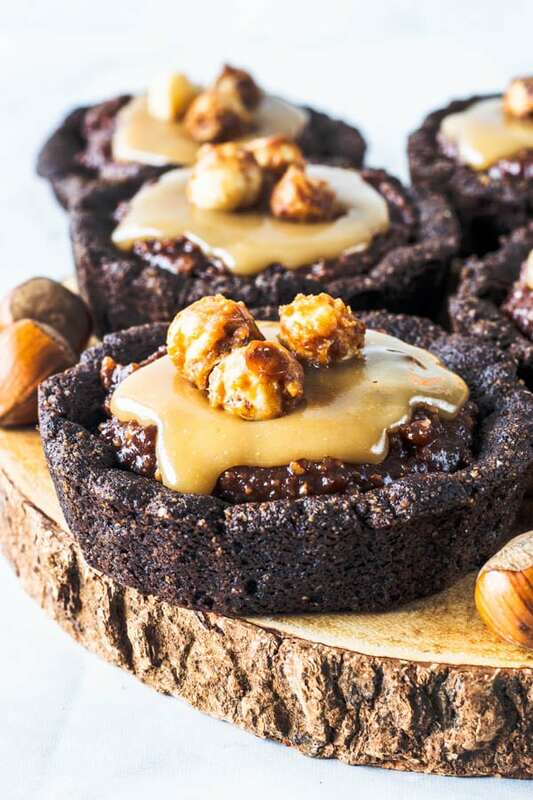 Top with the caramelized nuts. Tarts will keep well in the fridge for up to 4 days, well covered. 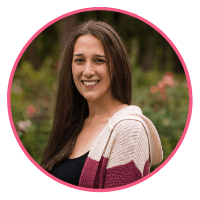 *I recommend measuring the dates by weight, because you might be using smaller or bigger dates than I am and that might impact the recipe. Going by weight assures the measurement is correct. *Make sure the coconut cream you are using is the full fat coconut cream, not milk. They are two different things. The coconut cream will be way thicker and it’s what we need for this recipe. I include links above in my post to my favorite coconut cream brand. *Remove the crusts from the tart pan while the crusts are still at room temperature. 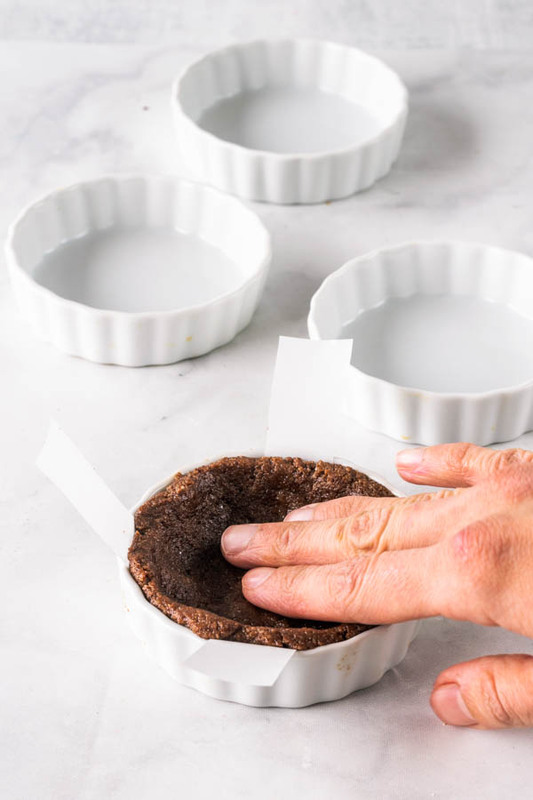 If you brush your tart pans with coconut oil, the coconut oil will solidify in the fridge, and make it harder to remove the tarts from the sides of the pan, if you are planning on unmolding them. Tudo está perfeito, a execução e apresentação, não tem como não gostar!!!!!!!!!!! OMG This looks AMAZING Camila, I will need to make this for my next tea time with friends!!! Thank you Dani!! You will love it!! It’s one of my favorites!! !